As someone who’s slouching towards minimalism, the holidays pose a unique stress in my life. What to do with so many gifts? As much as I might want to request only experiences or (dare I say it?) cash as gifts, there’s a certain joy in the giving and receiving of tangible things, carefully chosen by a loved one. So I try to pre-empt the discomfort of bringing less-than-necessary new objects into my life by making my needs and occasional wants known. Case in point: last Christmas, I asked for nut milk bags and/or cheesecloths (#stereotypicalvegan) for my vegan cheese-making adventures. Ask and ye shall receive. Receive I did — not just one, not two, but three varieties of cheesecloth and nut milk bags. Happily, they were all different, serving unique purposes in my kitchen. Did you know that you can use cheesecloth to strain cold-brew coffee? You can! We did! But while the cheesecloth was in regular kitchen rotation, my poor nut milk bag remained neglected. Honestly, I was a little apprehensive about making my own milks. I don’t have a fancy Vitamix or Blendtec; my run-of-the-mill blender has been known to require gentle coaching to perform the simplest of tasks. Even making smoothies with frozen bananas is an adventure! I expected the worst if I tried to blend something more resistant. But then a friend mentioned how much she loves being able to whip up a batch of cashew milk whenever she’s running low. Sure, she has a Vitamix, but still! And then Steven received Miyoko Schinner’s The Homemade Vegan Pantry for his birthday, and my desire to start making my own staples finally transformed into action. 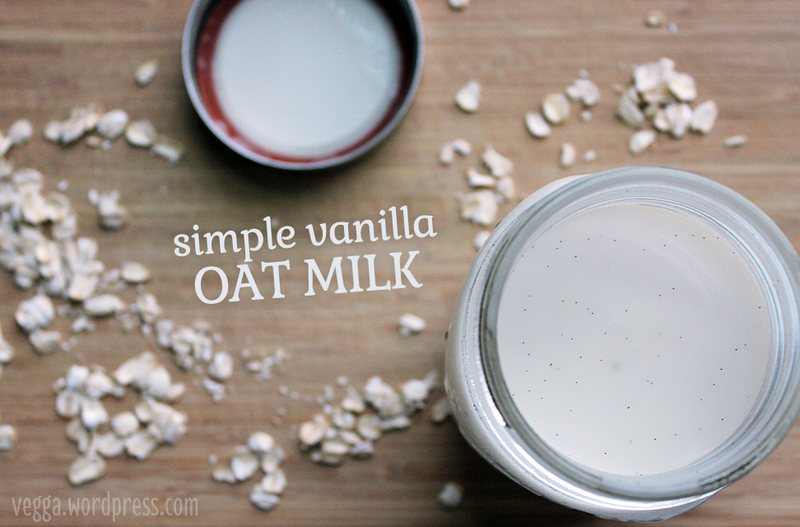 So, today, I’m sharing the easiest of easy homemade non-dairy milk recipes. To make oat milk, the only equipment you need is a blender and a nut milk bag. Unlike nuts, oats require very little soaking, so you can make a batch in nearly no time. And if you, like me, lack a fancy-pants blender, you’ll still be able to have creamy, delicious non-dairy milk without a trip to the grocery store. 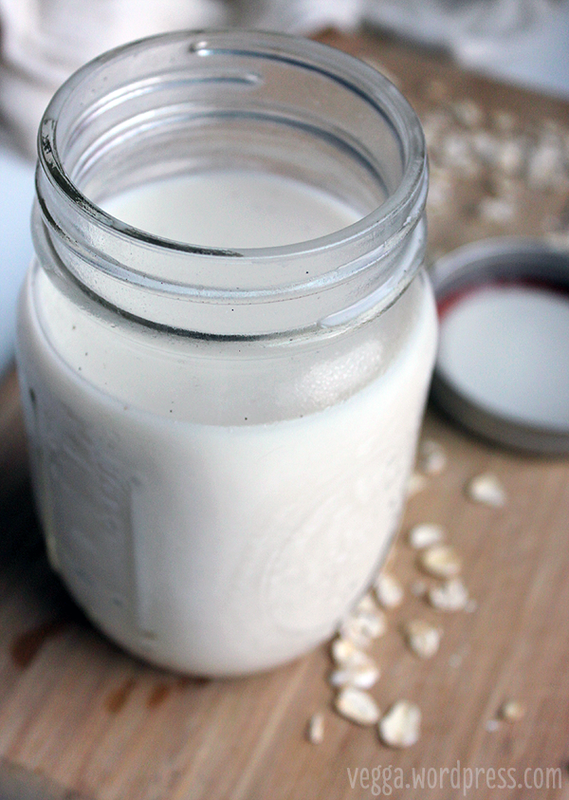 Place a nut milk bag over a large measuring bowl or mason jar and pour the oat milk through the bag. Use your hands to gently squeeze out the milk, but most of it should strain very quickly. Set the bag aside. Pour the milk back into the blender and add the maple syrup and vanilla. Blend for 10-15 seconds, pour back into jar, and refrigerate. 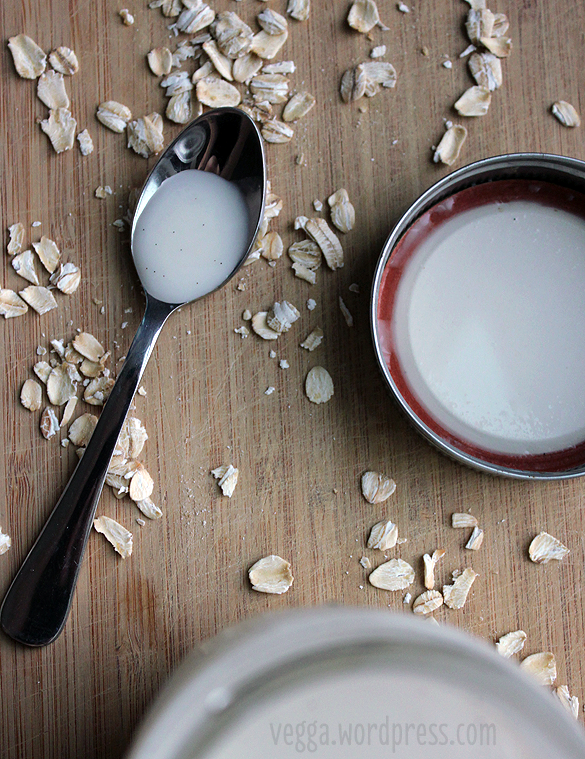 Oat milk will last about a week in your fridge. Note: You can use vanilla extract instead of vanilla beans if you don’t have them or don’t want the visual effect of the seeds in your milk; I just didn’t want to add alcohol to mine.